They say every memory has a soundtrack, which is why music memorabilia is so popular. Music and the collectible items around it connect us to the past — both music history and our own personal history. And rock band memorabilia offers one of the best ways to make sure memories last. 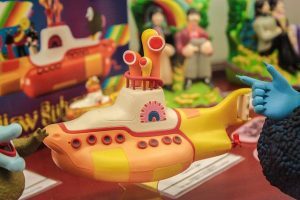 At Record Head, we carry a huge selection of collectible music statuettes, Beatle figurines and other music memorabilia at our West Allis location. We love this community, and we love music. But most of all, we love connecting Milwaukee area residents with the rock band action figures they want the most. Stop by our store in West Allis, or contact us any time with questions or other inquiries. We’re always happy and excited to help music enthusiasts in our area. Why does selection matter? First, it's important because many of our customers are looking to buy music collectibles and specific memorabilia. Having a wide selection helps ensure that our customers can find what they’re looking for. Also, selection matters because many of our customers simply want to browse and explore. By offering a wide selection of rock and roll memorabilia in Milwaukee, we make sure our customers can enjoy an immersive experience during hours of looking at, enjoying and considering the music memorabilia we have to offer. Have questions about a certain item or our collection in general? At Record Head, our team members are passionate about music and deeply committed to delivering excellent customer service. Each staff member can provide answers to your pressing questions, and each can help walk you through our collection if you're looking for something specific. You’re never alone when you shop at Record Head — our team can help you find the music memorabilia you’ve been searching for. You'll enjoy everyday competitive pricing at Record Head. We know the market for rock and roll memorabilia in Milwaukee, and we price items fairly so that you’re never taken advantage of. Yes, music memorabilia can rage in pricing based on the item and its rarity. But you’ll always find competitive pricing and a team of individuals eager to answer questions and provide support when you shop at Record Head. What Makes Record Head Different? You’re welcome to stop by our West Allis location and browse for yourself, or you can always give us a call at 414-453-3900 with questions or other inquiries. Since 1972, we’ve been serving the Milwaukee area with the best selection of music and movie memorabilia, used electronics, rare records and more. We’re committed to providing the biggest and best selection possible, and we’re equally as committed to delivering service that goes above and beyond customer expectations. What type of Beatle figurines, collectible music statuettes or rock band memorabilia are you looking for? No matter what, you’ll find the selection and support you need at Record Head. Visit us today, or contact us about your search for music memorabilia.